If you are struggling with hearing aids, an implant may be for you. 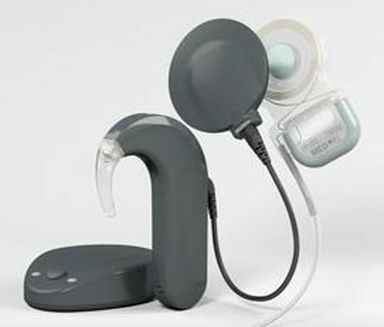 Implantable options include: cochlear implants, bone conduction implants or middle ear implants. Each is designed to circumvent a part of the normal transmission pathway of our auditory system. Candidacy for each kind of implant is based on patient specific audiological and medical information and requires a thorough work-up by an Audiologist and medical team. More and more patients are being considered for implants of all kinds due to improvements in technology and research showing positive outcomes for more broader degrees of hearing loss and presentations. If hearing aids are not helping you enough or for medical reasons you cannot wear a hearing aid, an implant maybe an option for you. 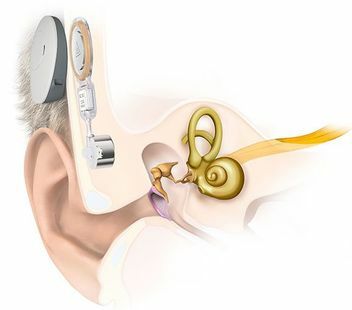 A Cochlear implant is a device that is implanted inside the cochlear. It is able to take acoustic signals from the outside world (with a speech processor worn on or near the ear) and ​convert them into acoustic nerve impulses in an intelligent way that mimics natural hearing. Cochlear implants were once only reserved for patients with a profound hearing loss but with improvements to both speech processor and electrode array technology, patient's with more remaining residual natural hearing are being considered. Besides medical factors like having a functioning hearing nerve, whether or not a patient is a candidate for a cochlear implant depends highly on the probability this patient will have improved speech perception from the implanted ear after surgery. From studies conducted on hundreds of cochlear implant patients who have had varying degrees of hearing loss & pre-implant speech perception abilities with a well fitted hearing aid, researches have been able to determine the probability of a patient performing better with a cochlear implant. In general, if a patient's open word speech perception score with a well fitted hearing aid is less than 55%, the probability of performing better with a cochlear implant is around 70%. Before considering cochlear implants, it is important to ensure you have given well fitted, well chosen and good quality hearing aids a try as further improvements in speech understanding may be possible with the right hearing aid. 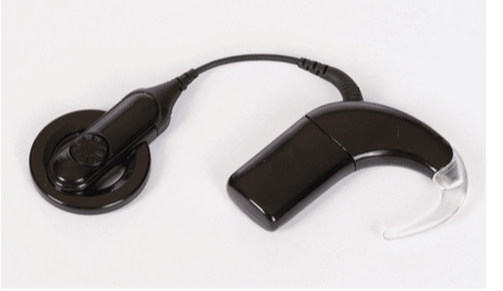 If this has already been tried and tested, then a cochlear implant may be your next move. Speak to one of our Audiologists if this is something you would like to explore and we will be with you every step of the way. Bone Conduction implants work very similarly to conventional hearing aids except instead of transmitting sound in the form of air vibrations down the ear canal, a bone conduction implant will bypass the ear canal and transfer sound to your cochlear via bone vibrations. 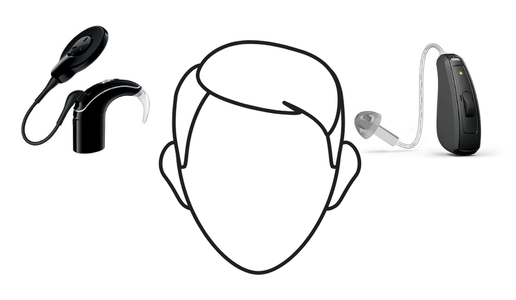 Bone Conduction implants are suitable for patients born with malformed ears (atresia, anotia or microtia. 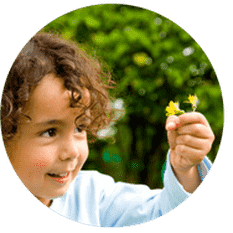 They are also a good option for patients who are not allowed to wear conventional hearing aids due to chronic ear infections or for those born with a profoundly deaf ear (single sided deafness). Although they are implantable, the processor or the part that detects & processors the sound is detachable and worn on the outside usually around the the mastoid area behind the ear via an implantable magnet (also known as skin drive). There are also some bone-conduction devices that are not implantable at all but are still skin drive. If more power is required, the processor will usually be attached to an abutment or directly integrated into the bone (also known as direct-drive). This is the most direct way to transmit sound conduction with minimal energy loss. The amount of power required is dependent on your bone conduction thresholds which are measured as part of a comprehensive hearing test. As part of the candidacy work-up, patients will need to undergo a trial of the device (usually worn with a soft headband), an appointment with an ENT to determine the suitability of different devices as well as demonstrate the ability & motivation to take care of the site of surgery if surgery is required. Another device that bypasses the ear canal is called a middle ear implant. 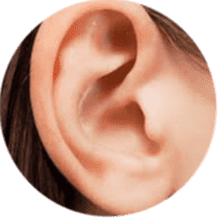 Instead of vibrating the bone that encases the cochlear (otic capsule), a middle ear implant is either attached to the round window of the cochlear or one of the ossicles within the middle ear cavity. A middle ear implant is suitable for patients whose bone conduction thresholds are too poor for a bone conduction implant and who are not suitable for cochlear implants. 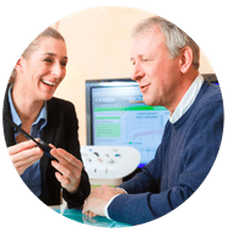 Did you know Pristine Hearing is proud to be one of only a few independent clinics in Perth and Western Australia for that matter who offers an Implant Service. We are with you every step of the way from candidacy assessments, referral pathways, liaising with your Ear, Noise and Throat Specialists, travel, accommodation, surgery, switch on, device mapping or adjustment services, aural rehabilitation and communication training and if required, ensuring your other ear is equipped with a hearing aid that is compatible with your implantable device. Will an implant work with my hearing aid? 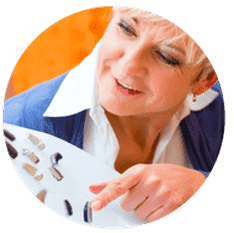 A lot of patients these days receive an implant in one ear while the continuing to wear a hearing aid in the other, otherwise called bimodal hearing. Our brain is an amazing organ that is able to adapt to changes in our environment and sensory input. 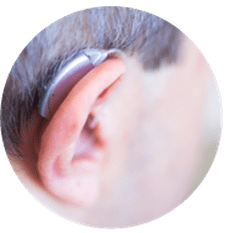 Not only is it capable of getting used to hearing with an implant from one ear, but it can synchronise information from both ears in a way that improves the overall sound quality. 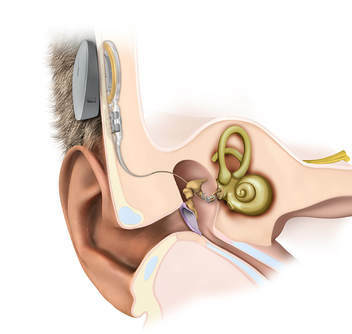 In recent years, implant technology has closely mirrored hearing aid technology making bimodal options more synchronised and compatible with each other. This has seen improved outcomes for patients and the easier management of two different devices. This has lead to an increase in demand for Audiology clinics to be able to specialise in both hearing aids and implants to improve patient outcomes as well as minimise the number of specialist appointments a patient requires. Why choose Pristine Hearing for your implant needs? The aim of an audiologist who sees a patient with a bimodal setup is to help the patient integrate the sound from both devices over time. To do this, it is very helpful for the Audiologist to be able to make adjustments to both devices in the one appointment to optimise the balance and loudness between them. Patients who have a separate Audiologist for each device will often experience inefficient optimisation and could have a rehabilitation program that takes longer than it needs to. Make an appointment today to discuss how an implant could help you. How are implants funded in Australia? The costs of any surgery can be considerable. Couple this with a sophisticated medical device that is an implant and the costs can quickly add up. ​Luckily in Australia there are several funding options (public & private) available for patients. Through State Government funding, hospitals (like the Fiona Stanley etc) are able to fully fund a number of implantable devices every year. There usually is a waiting period involved. The funding usually covers both the device, surgery and hospital stay. Funding is also usually only allocated for the one device (e.g. unilateral surgery). Depending on your level of cover, most funds will fully cover the device (implant and processor). The majority of surgical costs can be covered by a combination of private health insurance and Medicare. Please note that there may be some out of pocket expenses depending on your level of cover and the ENT charging for the procedure. If you do not have private health insurance and are not eligible for state public health funding, you always have the option of self funding the procedure and device yourself. If this is your only option, please see this page for more options. Australian Hearing and NDIS are also an option if you qualify. 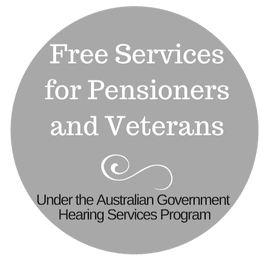 Pristine Hearing does not charge for any out of pocket expenses for rehabilitation services associated with cochlear/ bone conduction implants as this is covered by Medicare with a referral from the ENT. Accessories, batteries and device upgrades can be funded through Private Health Insurance but we recommend checking their policy thoroughly. Otherwise you may want to consider funding through the NDIS. If you would like more information or if you would like to discuss implants in more detail, either call (08) 6336 7170, email or fill out the form below.